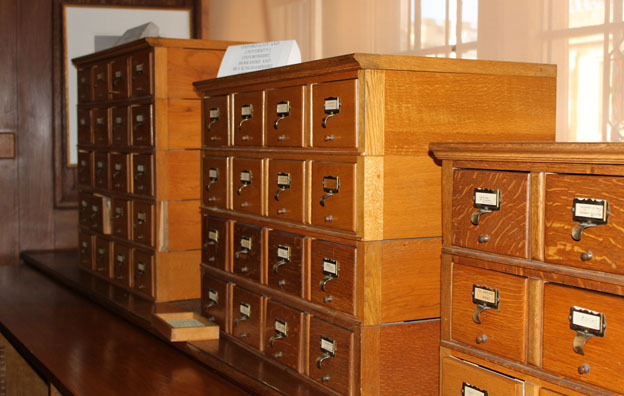 With the first phase of our Project at an end and our second phase now well underway, it seems an appropriate moment to look back at our work thus far on EMLO and to return to the dataset that lies at its core: the ‘Index of Literary Correspondence’ in the Bodleian Library, a card catalogue which occupies an imposing set of wooden filing drawers at the ‘Selden End’ of the Duke Humfrey’s Reading Room. Wooden Worlds: The Bodleian’s iconic ‘Index of Literary of Correspondence’, pictured in situ at the so-called ‘Selden End’ of Duke Humfrey’s Library. Previously available only on-site, it is now one of the core datasets in Early Modern Letters Online. This remarkable free-standing resource, describing a significant percentage of Bodley’s rich holdings of sixteenth-, seventeenth-, and eighteenth-century correspondence, had been accessible until recently only to those working on-site; as per our brief, it has been scanned and digitised, and now its 48,691 unique records can be searched and browsed online within EMLO, radically improving the discoverability and manipulability of the cards and the letters to which they refer. However, until now, we have known nothing about the creation of the analogue card index beyond a farrago of hearsay, local anecdote, and library lore; those who compiled the records, and the intellectual principles on which they, and their supervisors, operated, were proving elusive. This frustrated both our attempts to understand and appreciate the overall shape of the catalogue in terms of what is and is not included, as well as our efforts to credit those epistolary Stakhanovites on whose painstaking work our digital effort has depended. 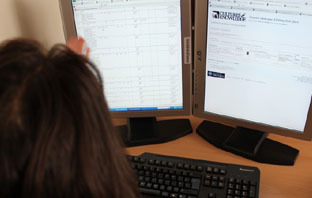 Editing metadata from the cards in EMLO-Edit, the editorial environment of Early Modern Letters Online. We are pleased, therefore, to be able to share a near-complete narrative of the genesis and evolution of the card index, based on completely fresh archival research.1 The pursuit of such questions is not only of local, antiquarian, or Project interest; the recent archival (or technical) turn across the humanities and social sciences, now manifesting in conferences and research networks, has established repositories not only as sites for research but also as ‘fascinating objects of study’ in their own right.2 It is recognised now that the ‘material conditions, infrastructures, and mediations’ of archives have a constitutive role in knowledge production,3 with cataloguing practices in particular shedding light on the intellectual ambitions of organisation within particular institutional contexts, and influencing the discoverability of documentary objects, and — in turn — the kinds of histories which ultimately can be made. Indeed, the card catalogue itself — direct descendent of ‘Harrison’s Indexes’ (as described by intelligencer Samuel Hartlib)4 and linchpin of repositorial efforts to marshal ‘stuff about stuff’ since the early twentieth century — has recently been given monographic treatment in Marcus Krajewski’s Paper Machines, an excellent sociology of card index technology which traces its journey from scholarly experiments in early modern Europe to the libraries and archives of the twentieth century via the French Revolution and corporate America.5 Krajewski figures these durable workhorses as ‘universal discrete machines’, 6 but they were of course populated by human hands within specific archival ecosystems. 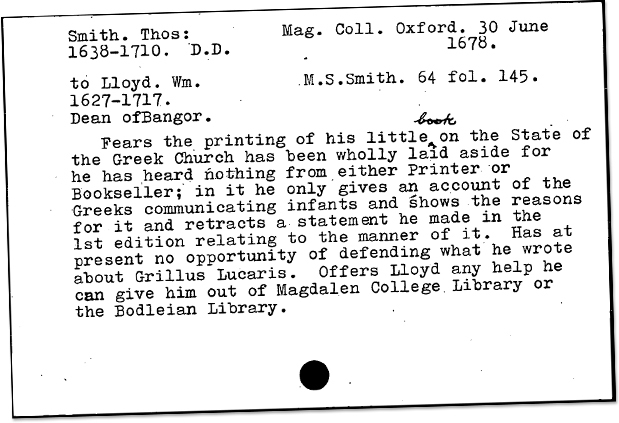 By cross-referencing curatorial documents with the Bodleian’s reports and records, we have reconstructed these processes for the Library’s epistolary card index, and are able at last to tell this catalogue’s story while contributing a small footnote to the history of information science. A representative index card (possibly the very first) from the initial phase. Founding Father? 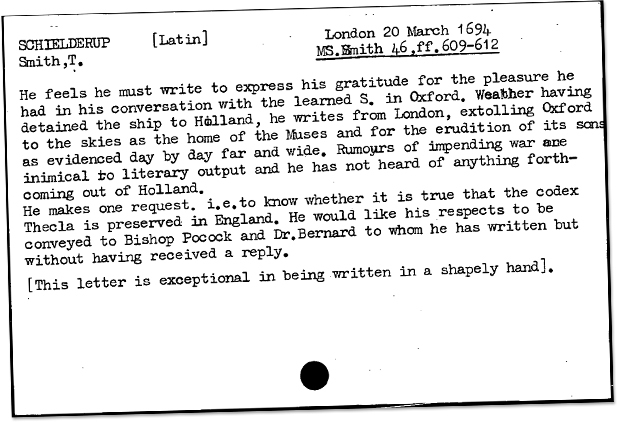 It is likely that Edmund Craster, the Bodleian’s first Keeper of Western Manuscripts, initiated the creation of the correspondence index. 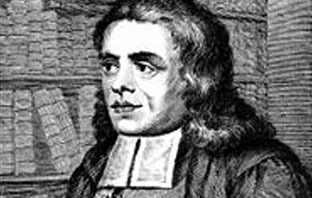 Local Celebrity: The letters of Thomas Hearne, the eighteenth-century antiquary and diarist, formed the focus of the first round of cataloguing. The staff member assigned to the work was Kate Muriel Pogson, a former post office clerk who joined the Library in 1913.9 She was was one of a number of female staff members recruited by Edward Williams Byron Nicholson (Bodley’s Librarian, 1882–1912) and his successor Falconer Madan (Librarian, 1912–1919) in connection with the ongoing revision of the main author catalogue.10 Following the onset of war, Pogson had been transferred temporarily to Finance, replacing R. A. Abrams, a Senior Assistant who left for the front11 — a role she seems to have retained — where she was praised for her meticulous work12 (which included preparing ‘a digest of the Accounts of the Library from the earliest times and finished it for the periods 1613–1670, and 1882–1918’),13 and in the early 1920s she produced several articles based on the Bodleian’s epistolary holdings.14 She would have been a natural choice, therefore, for the new enterprise. 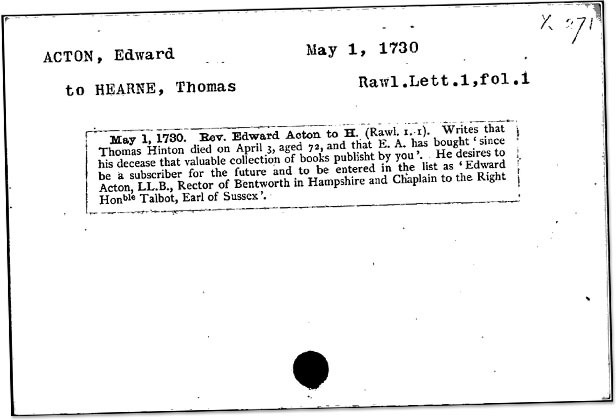 From 1927, Pogson worked on indexing the Hearne letters in the Rawlinson manuscripts, and from 1929 with the ‘assistance of Mr. H. W. Alderman … the correspondence of Thomas Rawlins (1723–49) contained in six volumes of the Ballard collection’, carefully recording her progress and queries in a dedicated notebook, which survives in the Library’s archives.15 It appears that, at the outset, her brief was to record no more than ‘writer and date’,16 but the scope of the exercise expanded in 1929 when the Reverend H. E. Salter (editor of the penultimate three volumes) donated of a set of printed sheets from the Hearne edition to be cut up and pasted onto the relevant typed cards to form thematic abstracts,17 and it would appear that Pogson — in a characteristic manoeuvre for those at the cataloguing coalface18 — returned thus to enhance her earlier records (see, for example, the card for Rawl. Lett. 1., fol. 1, illustrated above). Metadata Sleuthing: One of Kate Pogson’s queries on a ‘[l]etter from person in Africa’, recorded in the notebook she initiated, in which she uses palaeographical detective work to try to infer the sender. Pogson did not continue on the project beyond 1931, when the Annual Report of the Curators records bluntly that ‘work on the index of Hearne’s correspondence was suspended during the year’.19 The circumstances surrounding this abrupt discontinuation of the project after just four years of work are unknown, but it is possible that, as horizons expanded beyond Hearne to encompass the full wealth of the Bodleian’s early modern letter holdings and the creation of abstracts, Pogson’s paleographical skills might have been stretched beyond their limit. 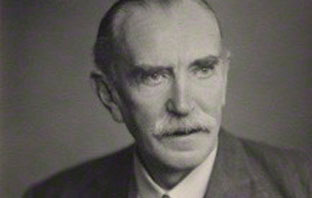 Changes in library management were likely also to have played a part: in 1931 Edmund Craster was promoted to the post of Bodley’s Librarian, while his successor as Keeper of Western MSS (a scholar of Ancient Greece called Edgar Lobel) may have had different curatorial priorities. A representative card from the second phase. 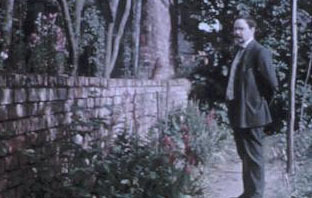 Garden Leave: Minn, a veteran of card indexes with a background in the history of science, at home in Leckford Road. Colour photograph (Paget Process) by Henry Minn. Early 20th century (Museum of the History of Science, Oxford, inv. 23360). 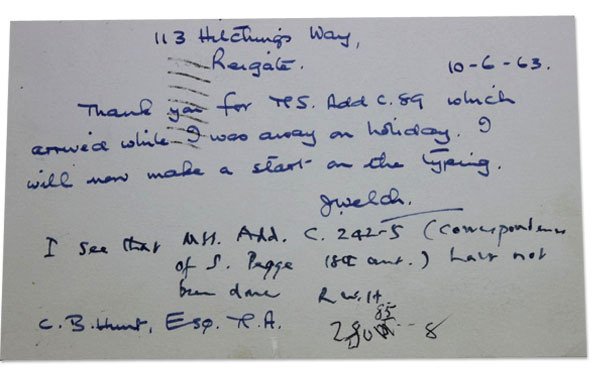 A typical card from the third phase, characterised by rich abstracts and additional commentary on the quality of the handwriting (or lack thereof). It has to be said that Hunt’s own hand could not be categorised as ‘shapely’ (see image below). The index slipped seamlessly into its third and final substantive phase in 1953 when a ‘Mr. C. B. Hunt’ took up the baton from Minn, seemingly with an initial brief to calendar ‘correspondence of H. Dodwell and R. Richardson’.35 A spry seventy-two year old, Colin Bertram Hunt was a retired local Inspector of Schools who had graduated from Balliol in 1903, studied at Harvard from 1903 to 1904, taught Classics briefly at Hackley Upper School, Tarrytown-on-Hudson, U.S.A., and had been a POW in Karlsruhe from 1917.36 He was himself an experienced and descriptive correspondent,37 while his linguistic and paleographical skills (significantly more advanced than those of the previous two cataloguers) enabled him to tackle the most recondite of letters. 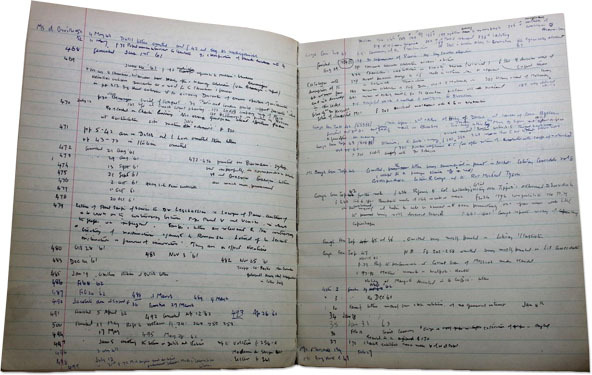 Notes and Queries: Hunt’s voluminous memorandums and comments in the working notebook established by Pogson. Epistolary Olympian: Colin Bertram Hunt enjoys a moment of well-deserved down time c.1960. He had been working on the card index for seven years at this point. Photograph courtesy of Julian Hunt. 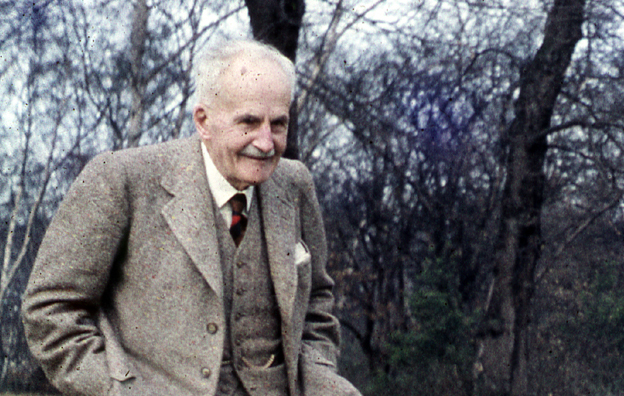 Such phenomenal numbers, while clearly due to Hunt’s extraordinary dedication and abilities, attest also to renewed interest in and attention to the indexing project on the part of library management, specifically from the indefatigable Richard W. Hunt (as far as we are aware at present no relative), a medieval historian who became Keeper of Western Manuscripts in 1945. Colin Hunt worked on-site in a bay opposite the reference desk in Duke Humfrey’s, where — just like an ordinary staff member — he was visited regularly by the Keeper in the course of the latter’s daily rounds.41 An interesting administrative by-product of this final phase testifies to Richard Hunt’s attentiveness to progress; on a postcard sent to Colin Hunt by a Reigate typist (to whom, evidently, the Library out-sourced creation of the typed cards), there is the following observation from the younger man: ‘I see that MSS. Add. C. 242–5 (correspondence of S. Pegge 18th cent.) have not been done. R.W.H.’42 Duly, in October 1963, Colin Hunt turned to these manuscripts, which were among the last he indexed before he retired for reasons of ‘health’ soon after 24 November of that year (the last date he entered into the working notebook established by Pogson, which — like Minn — he continued to use).43 Following Hunt’s retirement, work on the catalogue came to an immediate halt. Just 174 cards were added on a sporadic basis over the course of the following decade. Postcards from the Edge: Keeper of Western Manuscripts Richard W. Hunt annotates a postcard from a typist with an observation on progress. A blog post is not the place to elaborate a full range of conclusions emerging from this brief case study — although a second installement will follow in which I intend to consider exactly what was catalogued when, as well as which manuscripts were not selected for inclusion — but what is perhaps most interesting about the creation of the Bodleian’s Index of Literary Correspondence is its ad hoc, iterative, and almost casual nature. It was compiled, piecemeal, by enthusiastic and talented amateurs and its progress over thirty-five years was characterised by false starts, abrupt changes of direction, moments of disruption and caesura, and luck. Whilst tied intimately to changes within the Library prefecture, supervision of the project appears generally to have been light; there was no attempt to standardise ontologies between each of the three phases, and it seems that even those Keepers who took the liveliest interest in the enterprise (Craster and Richard Hunt) may have guided the indexers orally rather than providing extensive formal written instructions and schedules for data-capture. These eccentricities notwithstanding, the Index of Literary Correspondence is a sensationally interesting and useful resource, and — in line with the general electrification of libraries — lives on in its new incarnation within the digital realm of EMLO, forming the core around which our virtual machine will grow. Not only are its records now freely available to users worldwide and more siftable and discoverable than ever before — the mobile carriers of the card catalogue find their logical extension in the online relational database — but we have used EMLO’s powerful editorial environment (much more flexible than anything enjoyed by our predecessors) to link them to an ever-wider range of cognate records and resources, and to deal sympathetically with some of the peculiarities of the catalogue likely to be most frustrating to the modern user, in particular the wildly divergent expression of proper nouns (which we have standardised and de-duplicated using our merging toolset). Alongside these new digital impulses, we have tried to preserve the integrity of the paper machine, not least by reproducing in the front-end scanned images of the original index cards alongside the cleansed metadata. In a very real sense, the Project’s digital work on the index since 2010 has been a triangulation between ourselves, the senders and recipients of the letters being catalogued, and — it turns out — just three indexers, to whom now we are delighted to be able to give names and stories. If you have information to add, or your own card index-related stories to share, please let us know in the comments section below. This entry was posted in Letters in Focus, Project Updates, Publications, Websites, Databases, Apps, & Code on April 26, 2013 by Miranda Lewis.